There are so many choices when it comes to headphones these days, especially with the connection methods apparently in flux now thanks to Apple some manufacturers ditching “legacy” connectors. Today we are looking at a Bluetooth Active Noise Cancelling set of headphones from JLab Audio. Are Bluetooth Noise Cancelling headphones the right choice? Let’s take a closer look. Anyone who games or enjoys music at all, should own at the very least, a decent pair of headphones. I used to be real big into top shelf offerings for PC speakers, but now that I have a family, I almost exclusively use headphones. There are so many different types of headphones now, varying from headband construction technique (i.e. suspension, solid band, etc) to connection method (i.e. Bluetooth, USB, Lightning, 3.5mm stereo) noise canceling or not, the list goes on. What is Active Noise Cancellation you might ask? I’ll give the quick and dirty explanation now, for those whom already know, go on ahead. Active noise cancellation has been around for decades. It was originally pioneered to make the cabins of commercial aircraft quieter, as jet engines make a lot of noise. The way it works is, there is a microphone picking up sounds around you. The Active Noise Cancellation (ANC) technology processes that sound, and plays a sound that is 180 degrees out of phase with the noise in the environment around you, essentially canceling out the noises that you hear. For a more detailed description, follow this link. The headphones we are looking at are from a company called JLab Audio. JLab offers a wide variety of audio peripherals from earbuds with or without microphones in a wide assortment of styles and designs, to rugged/portable Bluetooth speakers, MP3 players, headphones with or without ANC and Bluetooth, and even clothing. These Flex Bluetooth with ANC headphones from JLab Audio have an overall muted aesthetic which I always prefer. The lines are clean, well-styled, and the fit and finish is consistent and high quality. The main body of the Flex headphones is all black, with some chrome trim around the ear-cups. The headband consists of some satin black brushed aluminum sidebars with a brushed stainless steel plate in the middle; the JLab logo is etched cleanly into the center piece. On the left ear-cup we find the volume controls which doubles as the track forward/back if you long press (pretty standard now on all Bluetooth devices). Other controls include the power button, 3.5mm input connector, and the ANC toggle switch. On the right ear-cup, we find the charge port which is a standard micro-USB. On the outside of each ear-cup we find a grooved material that is reminiscent of an LP, which I thought was a clever (if on purpose, if not, a happy accident) aesthetic. We also find the JLab Audio logo in a metallic finish at the back edge of each ear-cup. The ear-cups are not incredibly oversized for being considered over-the-ear, and are covered in a plush leatherette with ample, soft-padding inside. The headband slide-adjusts to fit your head, whereas the ear-cups not only swivel, but also have 90 degree capable hinges which not only are helpful for comfort, but also to store away neatly. Included with the Flex headphones is a nice travel case which is made of a soft plastic material, but has some structure to protect your headphones. Also included is a 3.5mm stereo connector in case you want to go old school, and of course a standard-fare micro-USB charging cable. Audio is so subjective, which makes it tricky to review. Some listen to nothing bud Dubstep, which is reliant on deep lows and crisp highs for a good listening experience, whereas others listen to rock which relies a lot on the mid-range. Some headphones are tuned to accentuate parts of the listening spectrum, some are reference (meaning a flat frequency response) and some (most) are made to balance it all, to give a well-rounded audio listening experience. The JLab Audio Flex Bluetooth ANC headphones take a more balanced approach: handles all musical genres well, but not excellent. When you consider the price point of $149 US, you aren’t going to be getting studio-grade audio here, it’s just not going to happen. Mix in Bluetooth and Active Noise Cancellation, you are talking big bucks ($300+) to get into what I would consider “studio grade” audio. I used these headphones at work, which I found I had to leave the Active Noise Cancellation turned off, otherwise I ran the risk of not hearing my phone ring, or a co-worker calling for me, even with the music I was listening to at a reasonable volume. The Active Noise Canceling feature is good, very good indeed. I wasn’t even really aware of how noisy my office was until I had been using these Flex headphones with the ANC, and then turning the ANC off, it was an impressive reduction in noise. I did find that with the ANC turned on, it did change the sound quality of the headphones quite a bit. In addition to the volume being louder, the audio seemed to be ran through an EQ, making the highs a little brighter, but sacrificing some on the low-end as well. The audio overall is good, but not fantastic. As I mentioned before, these are NOT studio grade and to be fair, aren’t claiming to be studio-grade. The lows are fairly deep and responsive, tight accurate bass thanks to 40mm drivers backed with neodymium. I found the battery life to be consistent with JLab Audio’s claims of 30 hours wireless, or 10 hours with ANC running. The Bluetooth portion of the Flex Bluetooth ANC headphones was on par with other Bluetooth devices I have used in the past. Easy to pair, and it quickly reconnected with my devices once I powered them on. The Flex also allows charging while connected over Bluetooth too, which seems to be a rarity these days. Even using the 3.5mm jack and charging, there is no noticeable noise or hiss. I listen to a very, very diverse musical selection and I found these headphones suitable for all forms, kind of like a jack of all trades and master at none (again, you won’t get master quality at this price point from ANY company). 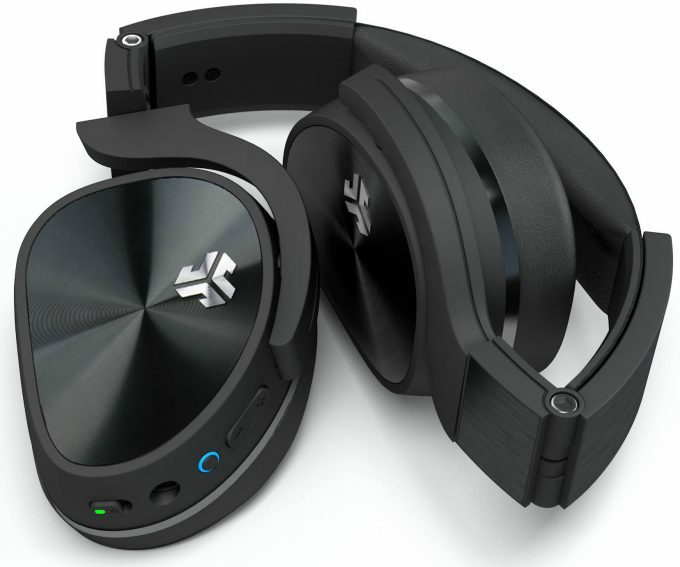 One feature I found missing that I thought a pair of headphones like these should have, is the ability to use these for teleconferencing, phone calls, etc. None of that here, so keep that in mind.